Mon., Sept. 11, 2017, 12:33 a.m.
By the time Tyler Hilinski found Jamal Morrow in the flat for the decisive touchdown of Saturday’s extravaganza, it felt like eons had passed since Luke Falk broke Washington State’s all-time passing record with a 59-yard bomb to Renard Bell. Really, it’d only been a few quarters and three overtime periods. And by the time the game ended, Falk’s record-breaker was probably not even of the 15 most important plays in Washington State’s 47-44 triumph over Boise State. There was so much to digest and little time to do it, which gives us plenty of leftovers this week. Here are all of the stats, nuggets, notes and quotes you may have missed from a wild night in Pullman. You didn’t miss this, surely, but it’s worth mentioning once again that Washington State quarterback Luke Falk is now the school’s all-time leader with 11,397 career passing yards and 11,141 yards of total offense. He jumped Connor Halliday for the first record and passed Alex Brink for the second. But … Falk has played in 32 career games at WSU and Saturday’s was just the second he was held without a touchdown. Washington State has now played in three triple-overtime games. The Cougars lost to Washington 29-26 in the 2002 Apple Cup and lost at Arizona 53-47 in 2000. 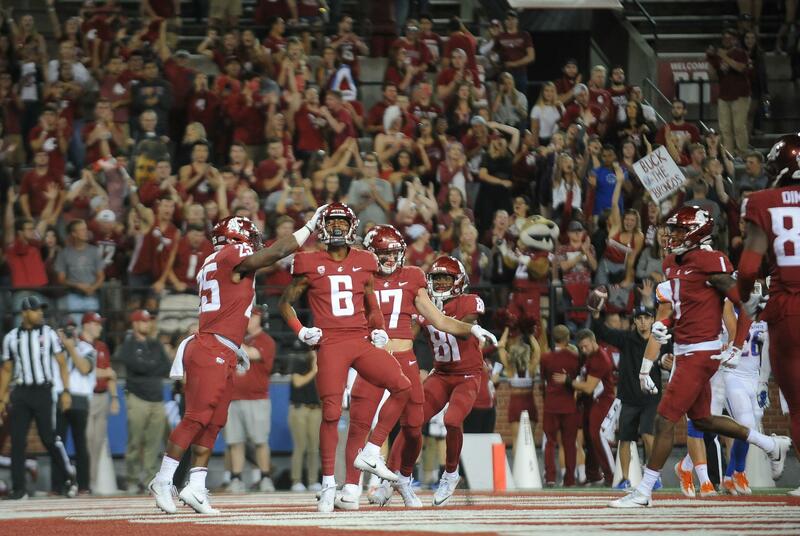 They rallied from a 21-point deficit for the first time since 1984, when the Cougars trailed Stanford 42-21 before rallying to win 49-42. The Cougars broke Boise State’s four-game winning streak against the Pac-12. The Broncos beat Arizona in 2014, Washington in 2015 and both Washington State and Oregon State in 2016. WSU had two defensive touchdowns before it had two offensive touchdowns. Leighton Vander Esch, the Bronco linebacker who once played 8-man football at Salmon River High in Riggins, Idaho, led all players with an astonishing 16 tackles. Vander Esch tacked on two sacks and had a forced fumble. Mark Rypien, the former Coug QB great, popped in to congratulate Mike Leach on the win during the postgame press conference. It was a bittersweet night for the Spokane native. Rypien’s nephew Brett started for the Broncos behind center, but left the game in the first quarter with an undisclosed injury. Brett didn’t return and Montell Cozart ran the show the rest of the way. Cougar tailback James Williams hit double-digits in catches for the second week in a row. The redshirt sophomore had 13 for 163 yards against Montana state and caught 10 balls for 36 yards against the Broncos. The Cougars were the first team to score an offensive touchdown on BSU in 2017. The Broncos held Troy to 13 points and without an offensive TD in the season opener at Albertsons Stadium. “The goal is to keep them off the board, so I don’t feel like we did enough,” BSU defensive end Durrant Milres said. Not one but TWO shovel passes were intercepted, which truly is a shame considering Mike Leach spent a portion of a press conference five days earlier demonstrating the shovel. Renard Bell caught seven passes for 107 yards – both of course career highs for the true freshman who was playing in just his second college game. It’d been two years since the Cougars had scored a defensive touchdown. Shalom Luani returned an interception 84 yards in 2015 versus Oregon State. The last time WSU logged two defensive touchdowns in the same game? 2013. Damante Horton and Casey Locker both had int. returns in a home game against Utah. Powell handled five of the six kickoffs and Jack Crane handled the other. Special teams coach Eric Mele said last week the Cougars would keep Crane in the mix this season. WSU utilized three punters in the game. Kyle Sweet punted four times, Powell did it twice and Mitchell Cox booted one punt for 35 yards – the first punt of the season for the senior from Kent. Erick Glueck (special teams) and Mason Vinyard (Rush LB) both made their WSU debuts in the game. Tavares Martin Jr. caught eight passes for 66 yards, making it 19 straight games that the Belle Glade, Florida, native has made a catch in. The Cougars are 2-0 to start the season. That hasn’t happened since 2011 – Paul Wulff’s last year at the helm in Pullman. Running back Jamal Morrow was the Wazzu captain for the 24th consecutive game. He improved his coin toss record to 17-7. Published: Sept. 11, 2017, 12:33 a.m.